Welcome to another edition of the Ohio State football recruiting notebook. It has been a relatively slow week in the world of Buckeye recruiting. The biggest news of the week is probably Ohio State's top remaining target, Hinesville (Ga.) Liberty County linebacker Raekwon McMillan naming his top six and setting his official visits. A couple of weeks ago, many thought 2014 athlete Noah Brown was very close to committing to the Buckeyes. This might no longer be the case. Two players with Buckeye offers are announcing their college selection on Monday. The Bucks were once considered the leader for one of these players. We'll predict their final destination(s) in the buzz. One of the top players in the 2015 class was on campus for a visit this week. We'll tell you which top recruit was in Columbus and how things went. A few players the Buckeyes showed interest in committed to other schools in the last week. We will tell you who and where they're headed to play their college ball. We'll also take a peak into the future of Buckeye recruiting. Join us after the jump to learn about the past, present, and future of Ohio State football recruiting. 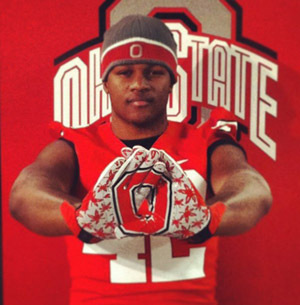 Hinesville (GA) Liberty County linebacker Raekwon McMillan has been a top target of the Buckeyes for well over a year. He named a top six of Alabama, Clemson, Florida, Georgia, Ohio State, and Ole Miss. He also set official visits with five of the six schools. He will kick things off with a visit to Georgia, September 28, when the Dawgs take on LSU. He will then travel to Clemson to watch them play Florida State, October 19th. Next comes a visit to Columbus, October 26, for the Penn State game, under the lights. He will wrap things up by visiting Alabama, November 9, and Florida, November 30. An announcement will come at the Under Armour All-American Game, in early of January. I still like the Buckeyes, but it's definitely not a done deal. Alabama, Clemson and Florida will provide stiff competition for the standout inside linebacker. He currently claims no leaders. 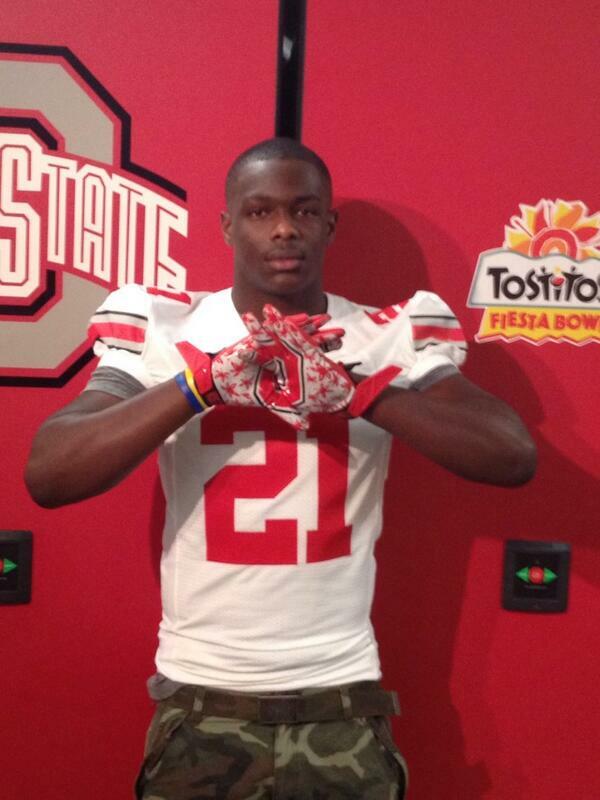 Sparta (N.J.) Pope John XXII athlete Noah Brown is another one of the Buckeyes' remaining targets in the 2014 class. A few weeks ago, some thought a commitment to Ohio State was imminent. This may no longer be the case. The 6-foot-2-inch, 210 pound athlete told Eleven Warriors that he wants to take more visits before making his decision. He currently has Ohio State as his leader, but that could change. I have never been on the Brown to OSU train and maintain he will end up going elsewhere. Probably to Rutgers or Virginia Tech. A pair of 2014 recruits – Fort Lauderdale (Fla.) University School defensive back Quincy Wilson and Fort Lauderdale Plantation athlete Chris Lammons – are announcing their college decisions on Monday. Both Sunshine state products hold offers from the Scarlet and Gray. At one point, many thought Wilson was going to end up playing his college ball in Columbus. OSU was really never in the picture for Lammons. The Florida Gators have taken over the lead for Wilson and they've always led for Lammons. I think both of these top prospects will commit to the Gators. Ermon Lane, Quincy Wilson and Chris Lammons are all making their decisions Monday. Should be a big day for the #Gators. 2015 Suffield (Conn.) Academy defensive tackle Christian Wilkins was in Columbus a few days ago for an unofficial visit. Things reportedly went pretty well for the top 100 junior. He is nowhere close to making his decision, but the Bucks have put themselves in a good position, early in his recruitment. Finally, Lessburg (Ga.) Lee County quarterback and Buckeye commit Stephen Collier will enroll at OSU early. It's always great for a recruit to start working out with the team early – especially when that recruit is a quarterback. A couple of players the Buckeyes either offered or targeted committed to another school in the last week. The biggest commitment came when Scottsdale (Ariz.) Desert Mountain wide receiver Mark Andrews chose Oklahoma last Friday. The massive 6-foot-6-inch wide receiver grew up rooting for the Sooners. Mark Andrews visited #OhioState but @Mandrews_81 will head to the #Sooners - his childhood favorite. Hilton Head (S.C.) Island defensive tackle Poona Ford committed to the Louisville Cardinals. Ford held an "offer" from the Scarlet and Gray, but it was most likely not a committable offer. He's a great addition for the Cards. Springfield (Ohio) linebacker Davonte James decided he'll play college ball for West Virginia. The Buckeyes expressed interested at the beginning of his recruitment, but never extended him an offer. Finally, 2015 Detroit (MI) Cass Tech quarterback Jayru Campbell committed to Michigan State. The Buckeyes never really had a chance to evaluate him, thus he never received an offer. This is a great pickup for Sparty. There isn't much to look forward to in the next couple of weeks, as things will be pretty quiet until the season opener. We will see recruits visiting for every game, starting when the Bucks host Buffalo, August 31.